Continuing uncertainty prevails about how the trend of coal imports into Asia will evolve over the next few years. Longer term restraints on growth are prominent and potential for a downwards trend to resume and intensify is widely recognized. Yet recent developments have encouraged a more positive view of prospects, at least in the short term. Some countries’ import reductions have been more than offset by recoveries elsewhere, resulting in regional expansion. Uncertainty, often implying pessimism, about the future trend reflects the obvious effects of environmental influences. Governments in a number of Asian countries, especially the larger economies, are taking steps to reduce pollution by switching progressively towards cleaner energy sources. While further economic progress is envisaged, together with rising energy usage, support for coal consumption and imports probably will be limited. importers. Hence this region is closely watched for any changes. Remarkably, over the past two years a recovery was seen, reversing the preceding sharp downturn which had been expected to persist. In 2018 there is a possibility that Asian imports may see an extended upturn. Vigorous economic growth among Asian countries recently has underpinned rising energy use, especially for electricity generation. Japan and South Korea have reached mature stages of development where energy demand has stabilized. By contrast in China, India and numerous smaller economies energy demand is still growing rapidly amid relatively fast expansion of economic output. An update by the International Monetary Fund, published in January, estimated that a group of emerging and developing economies in Asia had grown by 6.5% in 2017, a similar GDP growth rate to the 6.4% seen in the previous year. This group includes China and India and a sub- group comprising five members of Asean (Association of Southeast Asian Nations) - Indonesia, Malaysia, Philippines,Thailand and Vietnam. While China’s growth improved last year, there was a slowdown in India, limiting the entire group’s performance. The Asean five together achieved a slight acceleration. Elsewhere, Japan in 2017 saw an almost doubling of its sluggish advance in the previous twelve months, and South Korea’s economy saw a modest pickup. During the current 2018 year, according to the IMF estimates, emerging and developing Asia could experience an unchanged 6.5% average growth. Despite an expected slight slowing in China, India’s economy is predicted to accelerate. A stable rate of increase within the Asean sub-group is envisaged. In Japan, last year’s upsurge seems unlikely to be fully maintained, but in South Korea momentum may not change much. These changes have varying implications for coal. Favourable economic growth trends have positive effects on coal consumption, although other drivers are very influential, modifying the impact. One country, Indonesia, is a major coal exporter, so its trade involvement is dependent on the import demand evolution in Asian and other buying countries, and on the strength of competition from alternative suppliers. Over the past two years annual seaborne coal imports into Asia have fully reversed the sharp downturn seen previously, as shown by the table. After reaching a peak 923mt (million tonnes) total in 2014, based on calculations by Clarksons Research, the regional volume fell steeply by 67mt or more than 7% in the following year, to 856mt. In that 2015 year, China’s imports saw the second consecutive large annual reduction. Optimism about Asian coal buying faded. In the next year, pessimism was confounded when China’s coal imports increased strongly and, despite a downturn in India, the Asian total saw a partial recovery of 3% to 883mt. Doubts about prospects for extending the rebound proved misplaced in 2017, which saw a further but stronger advance of 49mt (6%) to a new record high volume estimated at 932mt. India’s purchases continued to decline last year, but in other countries the picture was very positive. Four-fifths of Asia’s seaborne coal imports consist of steam (or thermal) coal grades, chiefly destined for use in the electricity generating industry. Cement production and other manufacturing processes are also sizeable consumers. The remaining one-fifth is comprised of coking coal used in the steel industry by blast furnace mills making pig iron. The largest coal buyers in Asia — China, Japan, India, Korea and Taiwan — need imports of both types, reflecting either an absence of domestic supplies or insufficient quantities available. In India and China indigenous coal from domestic mines is produced in enormous quantities and satisfies a large part of the market. Other countries, such as Japan and Korea rely wholly or almost wholly on imported supplies. Coal imports into Asia benefit from progress in economic activity across the region, and broadly positive effects on energy demand. Strengthening electricity generation and steel production are features. However the impact can be diluted or masked by other changes. Large increases or decreases in domestic coal supplies, and domestic price variations, is one prominent aspect. Changes in alternative energy supplies — hydro-power, natural gas, renewable energy from wind or solar sources, and nuclear — also are increasingly visible in the power generation market. A recent report by the International Energy Agency estimated that in 2017 over two-thirds of the global 3% rise in electricity generation occurred in China and India. The same report also commented that global coal demand increased marginally by 1% after two annual declines, driven by stronger coal-fired power generation, mostly in Asia. China’s seaborne coal imports (thus excluding overland volumes mostly from Mongolia) are again the biggest among individual Asian importing countries. At an estimated 217mt in 2017, up by 9% from the previous year, these are still well below the peak seen five years ago before the steep fall, however. Several influences are relevant. Coal consumption in China last year picked up for the first time since 2013, increasing marginally by 0.4%. Production from domestic mines also rose, by 3% to 3,520mt. The coal market was restrained by anti-pollution measures designed to improve air quality in cities, placing more emphasis on cleaner energy sources. As a proportion of total energy consumption, coal usage reportedly declined by 1.6 percentage points to 60.4%, while clean energy including gas and renewables rose by 1.3 percentage points to 20.8%. In India seaborne coal imports seem to have continued on a downwards trend since the peak four years ago. The 2017 total, which one estimate puts at 191mt, was 4% lower compared with the previous twelve months. But definitive figures are not yet available and another estimate suggests a much smaller 1% decrease. Weakness has mainly reflected a better performance from the domestic mining industry, and success in boosting coal output sufficiently to keep pace with or exceed consumption trends. Japan’s continuing high but quite stable imports, which were up by 2% to 187mt in 2017, have been greatly influenced by heavier reliance on coal as a power station fuel in recent years. Since the severe earthquake and tsunami in 2011 and the associated Fukushima nuclear power station disaster, most nuclear plants have remained closed. Political opposition has resulted in only a few reopening, although more are scheduled to resume operating. Seaborne coal imports into South Korea last year expanded strongly after flatlining for several years. The 2017 total rose by 13%, reaching 141mt. Higher steam coal purchases apparently comprised all the incremental volume. Coal-fired power station usage was boosted by shortfalls in electricity supplies from nuclear plants. In Taiwan, imports rose by 8% last year reaching 70mt. A group of smaller importers has been contributing an expanding proportion of the Asian regional total. From around 80mt annually, during the past three years annual coal imports by this group have risen cumulatively by over 50%, including an estimated 15% increase in 2017, to 126mt. Within this category Malaysia, Philippines, Thailand and Vietnam have seen especially notable growth, but Hong Kong’s volume has declined. Forecasts of longer term growth in Asia’s coal imports arguably are difficult to justify, given the prominence of downwards pressures. It is not even clear whether a flat trend can be achieved. Nevertheless for the immediate future, this year and into 2019, prospects are more finely balanced. A downturn does not seem inevitable and it is at least conceivable that further growth, albeit probably modest, will occur. One aspect complicating the forecasting process is political influences in several coal consuming and importing countries. Some changes in government policies affecting imports are foreseeable as possibilities, but the probability of introduction, the magnitude of changes, the precise timing, and their effectiveness are almost unpredictable. Other policy changes may be unforeseen. In recent years and probably in the future as well, this aspect has been especially evident in China and India, although is not exclusively limited to these countries. Together, the two major importers receive over 400mt annually, comprising about 44% of Asia’s seaborne coal imports and more than one-third of the global volume. Consequently any large change in their purchases has a wide impact. Particular uncertainty about government policy relates partly to environmental measures directly targeting coal imports. Other policy changes indirectly influencing imports are often more prominent. These affect market drivers such as coal consumption, which can be determined by added emphasis on alternative energy sources, and by limiting or promoting domestic coal production where this resource is available. Given the wide potential for unpredictable policies to affect coal trade, in addition to the normal commercial imponderables relevant to all seaborne commodity movements, the usefulness of firm forecasts may appear questionable. Much guesswork is inescapable, and the end result is perhaps more a statement of a viewpoint than a reliable prediction. The Bulk Shipping Analysis calculations for 2018 Asian coal imports shown in the table were prepared against this background. Although the direction of change could be up or down, a moderate 2% increase raising the regional total to about 950mt seems quite realistic. Whether some individual components, especially China and India, will see upwards changes and whether these are as little as 2-4%, is unclear. Marginal or no change in Japan, Korea and Taiwan is also a debatable outcome. Elsewhere, prospects for some smaller importers are more solidly positive, perhaps over a number of years ahead. A large part of Asia’s incremental coal imports expected in the current year is concentrated within this group, which is predicted to see an 11mt or 7% rise, to 135mt. One relatively minor importer with potential for becoming more significant is Vietnam. Seaborne steam coal imports into this country are estimated to have grown over the past few years, from a minimal 1–2mt annually to reach about 10mt in 2017. Expanding coal-fired power station capacity could greatly boost volumes during the decade ahead. 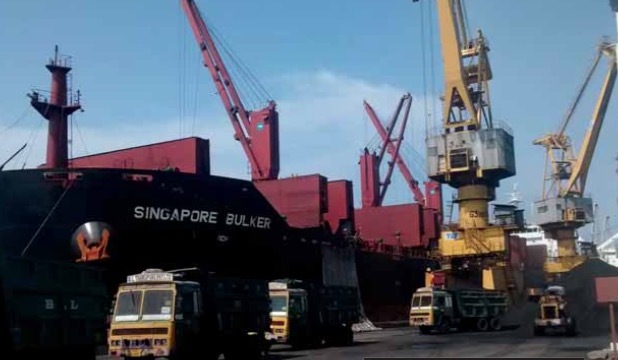 Port facilities are under development and last September DCI magazine reported a new floating transfer terminal being positioned in South Vietnam to receive coal imports arriving in large bulk carriers. In a detailed study published a few months ago, the International Energy Agency focused on energy demand in the ten Asean countries of southeast Asia. Energy consumption in this group seems set to grow strongly over many years, and coal is expected to have a major and expanding role in the trend. Foreseeable electricity demand expansion, with coal- fired power stations contributing a large part of the extra power generation, is a feature and a number of countries will become increasingly reliant on coal bought from foreign suppliers. Advantages derived by the shipping industry from participation in Asian coal import trades are restricted by the large part comprising short-haul movements from major supplier Indonesia within the region, in close proximity to the importing countries. Last year Indonesia reportedly exported steam coal totalling 319mt, up by about 2%, much of which was purchased by neighbouring buyers. Additionally a large volume of low-grade lignite exported was mainly bought by China. Some forecasts suggest that the export total could increase again in 2018. A proposal by the Indonesian Government has complicated the outlook for the country’s coal exports. It has been proposed that transportation of several key export commodities should be handled by domestic shipping companies. Plans for implementation of the regulation in late April this year appear to have been postponed. But opponents argue that, if introduced eventually, it has the potential to raise transport costs substantially and adversely affect the competitiveness of Indonesian coal in the world market.